Gilded golden on the wing. Goldenrod Grandmother, where are you now? It seems like only yesterday the path to your stone cottage was worn from our footsteps. During the day we came for your soothing elderberry syrups and your clover and linden teas. And when the shadows lengthened and curled around behind the evergreens, we would slip along the path for rose petal and hawthorne tinctures to mend the cracks in our broken hearts and agate amulets scripted with sigils to banish our fears. 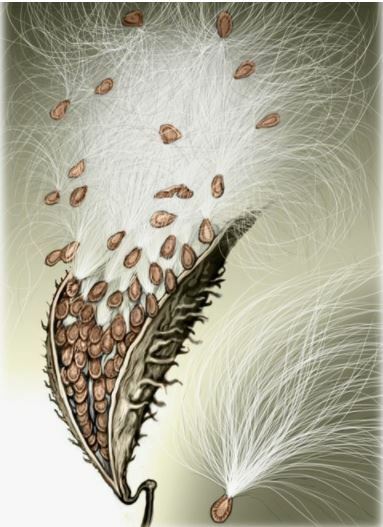 On that summer day we last saw you, the milkweed pod split and its silky white seed tails scattered across your fingers and floated down the meadow. The blood in your veins quickened to the rhythm of the cicadas and as you set off to gather herbs, you hummed your own heart song to the purple loosestrife, orange jewelweed and the cloudy white flowers of virgin’s bower that climbed through the thickets and sparkled in the green overgrowth. All morning you gathered tangy wood sorrel and succulent purslane. You dug stubborn burdock root and snipped the brittle stalks of dusty green seeded nettle that you carefully laid in your woven willow basket. And as you worked, the cicadas sang on and the sun rose higher until its honey warmth poured down upon your head and shoulders from above. It was only then that you stood up stiffly and realized that you would need a strong staff to lean on as you traveled home. By then, your heart was filled with such heaviness that you lowered yourself to the ground and your skirts billowed out around you. You watched as the auburn sun floated level in the western horizon and its golden light burnished all it touched. The cedar boughs trembled under its warm kiss, the spruce trees swayed in their sacred circle dance and the Scotch pines sighed and finally settled. The scented song of the balsams flowed into the air and made the Goddess smile. And there, hidden among the grasses, you found an old stem that was strong enough to raise you up and help you carry on. As dusk fell, you took those final steps home. Your aches and pains evaporated and the wearisome weight of your long years fell away. We heard you singing your heart song to the sturdy stem that helped you on your journey home and your voice floated higher and higher above the trees until your keening drifted far and wide and it was full of love and lightness of being. Some say you were transformed into a beautiful winged fae and wherever you flew, golden dust poured among the meadow grasses and a new plant began to grow. Its stems are straight, sturdy and strong and its golden yellow blossoms nourish us and lighten our hearts. Does your heart song still hum in the gilded corbiculae of honeybees who visit the bright and brilliant goldenrod that dances tall among the swaying grasses? Do you still gather the greenest herbs in the sunniest meadows? Do you still search for the deepest roots near the clearest running streams? Do you remember us Goldenrod Grandmother?